PEERS students will take a seminar each fall quarter. 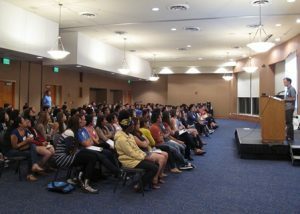 The freshman seminar is designed to help students transition to the university environment. Topics covered include improving time management, study skills, test taking strategies, and how to succeed at the university. The sophomore seminar is focused on exploring majors, career paths in the sciences, searching for a research mentor and lab, applying to work research labs, obtaining funding for research, and summer programs. Seminars are one-unit pass/no pass courses; attending 80-90% of sessions is necessary to earn a “pass” grade. The seminars are listed as Ecology and Evolutionary Biology 97X (EEB 97X) and held once per week for one hour. Students earn 1 unit of pass/no pass credit. Enrollment is facilitated by the PEERS program representative. The freshman seminar is led by the program directors, the PEERS program representative, and the freshman counselor. Each member of the PEERS leadership team facilitates one of the 10 sessions. The sophomore seminar is led by the program directors. Guests are invited to present on majors, careers in science, undergraduate research opportunities and more. One of the main goals of PEERS is to expose students to research opportunities. This is accomplished in a variety of ways. Each fall, juniors and seniors in capstone research programs are invited to present their research posters to PEERS freshmen and sophomores. This presents the undergraduate researchers with an opportunity to share the research they conducted during full-time summer research programs and presented at national conferences such as SACNAS and ABRCMS. Staff makes an effort to invite a representative sample of interest to students in a variety of majors. Attendance at the poster session is required as part of the freshmen and sophomore seminars. Each spring the Undergraduate Research Center-Sciences holds its largest annual event, Science Poster Day (SPD). 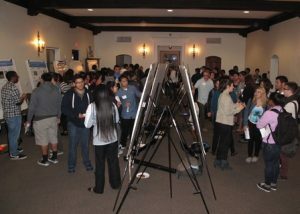 Over 400 math, science, and engineering majors present their posters. 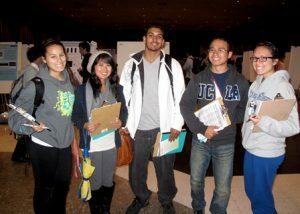 SPD is part of ULA”s Undergraduate Research Week. PEERS freshmen and sophomores are required to attend SPD and complete a short assignment (pdf). They are asked why they picked the poster, what they learned, and if they would be interested in doing research in that lab. One session of the freshmen seminar is dedicated to lab tours. The PEERS program representative recruits advanced undergraduate researchers, graduate students affiliated with the Undergraduate Research Center-Sciences and post-doctoral scholars dedicated to mentoring undergraduates. The lab tours are consistently ranked by students as one of their favorite aspects of the seminar. Finally, PEERS participants are required to attend six research talk by UCLA faculty per year. Directors invite faculty in varied fields to ensure that students from all majors represented by PEERS find topics interesting. A list of past speakers, titles of their talks, and video can be found on the PEERS guest speakers page. A meta-analysis by Springer et al (Springer et al. 1999) indicates that small group learning promotes “greater academic achievement, more favorable attitudes toward learning, and increased persistence” through STEM courses. “Collaborative Learning” is a common form of small group learning. Although there is no exact definition (Dillenbourg 1999), collaborative learning generally centers on students using their collective knowledge to solve problems in a small, collaborative group setting. The key aspect of collaborative learning is that students work together in “a coordinated synchronous activity that is the result of a continued attempt to construct and maintain a shared conception of a problem” (Roschelle & Teasley 1995). This student-centered active learning platform is associated with positive long-term learning outcomes (Derting & Ebert-May 2010).